On October 13 Tesla Motors reviewed their proposal for a 4.6 million square foot expansion of its electric vehicle factory in Fremont. This would nearly double the size of its existing auto plant and create 3,100 new jobs. Under Tesla’s new proposal, the expanded plant, which currently produces about 104,000 cars a year, could produce 500,000 vehicles a year. The expansion would accommodate the production of their newest vehicle model, the Model 3. For the first time, the International Association of Chiefs of Police, one of the world’s largest police organizations, publicly apologized on October 17 for “historical mistreatment” of minorities. Executive Director Terrence Cunningham opened his speech with references to activists, whose protests and social media posts sparked nationwide discussions about racial bias. Cunningham emphasized that acknowledging the mistrust of recent police’s actions will help both sides of the debate move past issues, towards a solution. Iraqi, Kurdish, and allied forces launched a military operation on October 17 to take back Mosul, the second largest city in Iraq, from the Islamic State. According to Reuters, before beginning the attack from the city’s east, the Iraqi army dropped leaflets over Mosul,“assuring the population thats advancing army unites and air strikes ‘will not target civilians.’” The troops planned to take control of the multiple villages outside of Mosul and push the Islamic State west into Syria. A couple is donating their award winning 820 pound pumpkin to feed 1,000 homeless people. Ray and Sarah Armstrong’s giant pumpkin came in second place on October 5 at the London Harvest Festival Show at the Royal Horticultural Society in Westminster, England. The couple found inspiration in other pumpkin growers, who donated their pumpkins to zoos. They decided that the flesh of the pumpkin will be made into soup, and the seeds will be sold for charity. 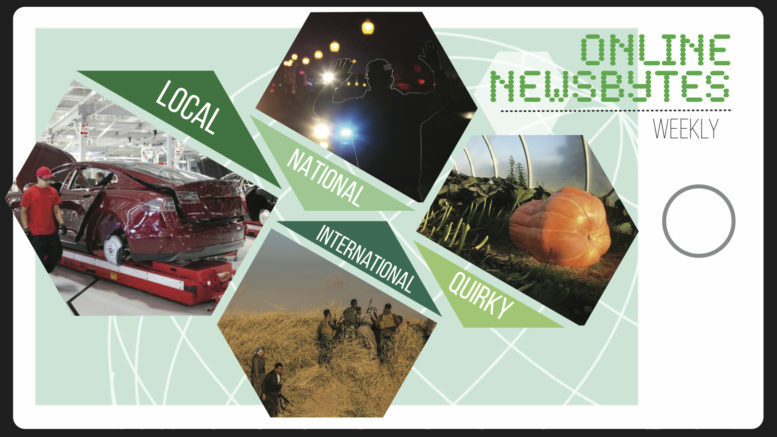 Be the first to comment on "Newsbytes: Tesla Expansion, Police Organization, Iraq Retakes Mosul, Giant Pumpkin"